I have had several listening sessions with B&W CM8 lately because it’s a very interesting alternative to the larger and much more expensive big brother B&W CM9. The question is, for €700 less then the price of CM9 does it even come close to the awesome sound and performance of its big brother? My first impression on the CM8 in direct comparison to the CM9 was almost disappointing actually. They feel thin and weak and don’t have much to give in the lowest bass frequency segment. Personally I would need to match the CM8 with a good subwoofer to satisfy my taste and needs. Furthermore not much else about the CM8 sound except for the brilliant and detailed high’s remind of the big brother CM9, and honestly I wouldn’t even call them brothers at all. Having said this it might sound like I am bashing the CM8 and calling them bad, but really I am not. The CM8 are for its price tag great speakers! I am just having a hard time to place them as the model directly below CM9. As far as sound characteristics they sound and behave more like B&W XT8 except for slightly less authority in the lower bass then what the XT8 perform with. The B&W CM8 are very power hungry and require quite a powerful amplifier to deliver their full potential. Sound stage is fairly big and controlled and has a nice and easy-to-like attitude. The patented FST technology mid-driver with its characteristic yellow Kevlar membrane delivers as usual an amazingly detailed midrange. The slightly smaller 5-inch mid-driver in CM8 compared to the 6-inch mid-driver in CM9 does indeed lack some of the finest details that CM9 has. The dual 5-inch bass drivers deliver a surprisingly powerful and rock hard mid bass that really feels when you turn up the volume! But as I already said, they drop in the deeper bass frequency range very fast. Over all the B&W CM8 truly is a good speaker! You should choose the CM8 if you like the sound, the design and the price. You should NOT choose the CM8 if what you really like is the CM9 but you think that CM9 are out of your price range. I honestly believe that the CM8 is not a replacement or a cheaper and smaller version of CM9 but rather a smaller and cheaper version of the XT8. I highly recommend that you listen to both CM8 and CM9 in the same room with the same equipment before you make up your mind. 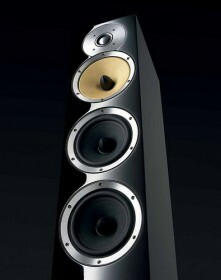 Other then that I could very much picture a pair of CM8 matched with a subwoofer standing in my living room.